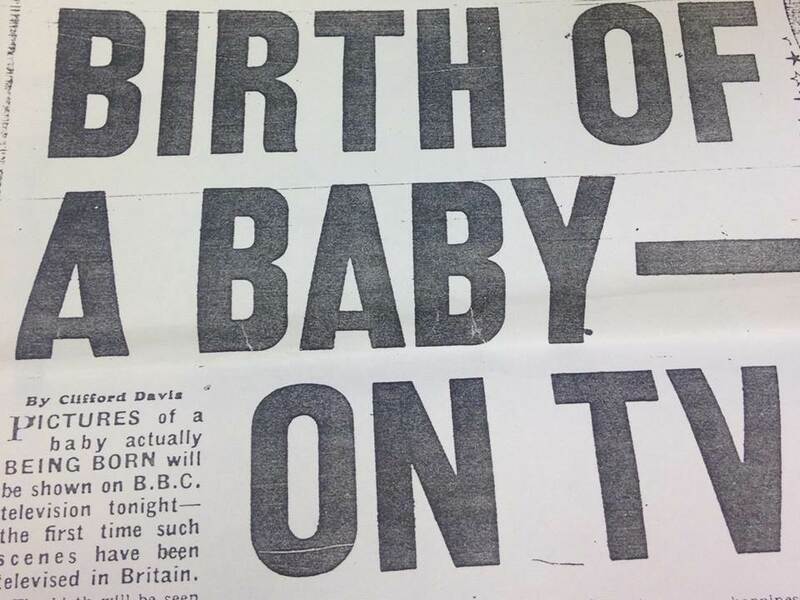 In 1957, a BBC Panorama documentary on natural childbirth showed a five second clip of a woman giving birth, the first time a baby being born was televised in Britain. While newspapers at the time questioned whether the controversial scenes should have been shown, today thousands of viewers tune in as the entire labour process is captured on the award winning documentary One Born Every Minute. Indeed, there have been a number of changes to childbirth since the 1950s, including a move from home to hospital births, the natural childbirth movement and the increasing presence of men in the delivery room to welcome their child into the world. Estimates suggest that the number of men present at birth rose from around fifty percent in the late 1970s to over ninety percent in the 1990s. Prior to 1970, only a minority of men would have attended the birth of their children as cultural expectations deemed it inappropriate and ‘umanly’. Thereafter, men began attending birth in increasing numbers, and although it was considered beneficial both as a support to their partners and as a way of strengthening the father-child bond, fathers-to-be were still required to ask for permission from a doctor or consultant in some hospitals. In contemporary Britain, the presence of fathers at childbirth is now considered the norm, if not essential; only one in 20 fathers are not present. Why did this transformation take place? Historian Laura King has recently investigated just this by exploring the ways in which British men have been involved in childbirth since the 1950s. The project ‘Hiding in the Pub to Cutting the Cord?’, examined both the causes and consequences of this shift for fathers, mothers and children. As part of my research into the representation and experience of fatherhood in Scotland, I will also be exploring men’s experiences of pregnancy and childbirth since the 1970s and specifically what it meant to become a dad in modern Scotland. While ultimately the decision of who attends the birth will be determined by what is right for the individual family, these everyday discussions of men and childbirth still powerfully stereotype fathers as either useless or disinterested. Yet for many men, attending the birth of a child is a life changing and emotional occasion. Part of my research will explore men’s reactions to pregnancy and childbirth in Scotland from the 1970s to the 1990s, when this dramatic transformation took place. Whether they attended childbirth or not, what were men’s expectations and roles during labour? How were they viewed by hospital staff? What are their memories of seeing their child for the first time? When the issue of paternity leave was raised in the House of Commons in 1979, the proposal was described by some as ‘grotesque’, ‘unrealistic, profoundly objectionable’ and ‘one which has only to be examined to see its absurdity.’ Opposing MPs claimed it would be a direct incitement to population explosion, that on leave men would earn large sums of money tax free through moonlighting and that the House would lose some of its ‘most virile and splendid Members.’ But how much progress has been made since then? Men gained the long overdue rights to statutory Paternity Leave in 2003 as well as Additional Paternity Leave in 2011, which allows the father, or husband or partner of a child’s mother, to take up to 26 weeks additional leave. Last week it was announced that Labour is looking at plans to give new fathers a so-called ‘daddy month’, four weeks of paid paternity leave – at nearly double the current rate. From 2015, parents will also get the option to share up to a year’s leave when they have a baby, under the Shared Parental Leave scheme pushed by Deputy Prime Minister Nick Clegg which aims to undermine ‘Edwardian’ rules which ‘patronise women and marginalise men.’ While undoubtedly these are positive steps in the right direction, the pace of change has been slow. In Sweden, families have enjoyed the right to Shared Parental Leave since 1974. The misconception that fathers matter less than mothers when it comes to the upbringing of children has long formed the basis of the UK’s approach to parental leave. Proposals for a Directive on parental leave were first put forward by the European Commission in 1983 and, despite a broad consensus among member states in favour of such a measure, opposition from the previous Conservative UK Government prevented the Directive’s adoption. 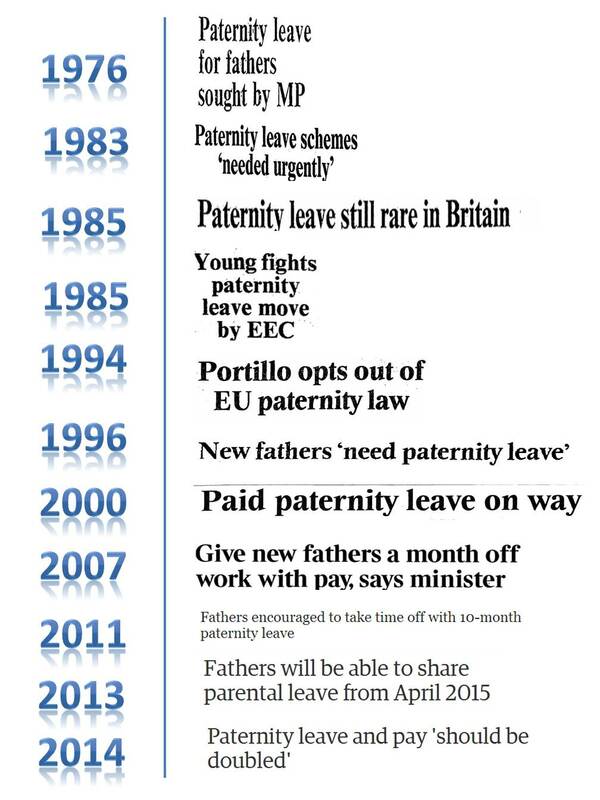 In 1995 the UK further refused to accept the European Directive on Parental Leave which guaranteed fathers and mothers in employment to at least three months (unpaid) leave and as the twentieth century came to a close, the UK and Ireland were the only two European members where there was no existing legislation providing for parental leave other than statutory maternity leave. According to a recent study in 2010 by the Fatherhood Institute, conditions for equal parenting in the UK ranked the fourth worst out of 21 countries measured, with a wider gender pay gap and less paid paternity leave than other nations. While men in Sweden for example, are eligible for the equivalent of 40 weeks full-time paid paternity leave, based on the average salary, their British counterparts are entitled to two weeks’ statutory leave, the equivalent of just two days at the average pay. The underdeveloped provisions mean few British fathers are taking advantage of such measures. Just 55% of fathers take off the fortnight, whilst a third do not take any of their statutory leave. Similarly, official figures show just 0.8% of eligible dads took advantage of Additional Paternity Leave in the first year of operation in 2011-2012 and only 1.4% in 2012-13. While men increasingly want to spend time with their children, they do not receive the same flexibility in the workplace to address child care requirements. Research by the Fatherhood Institute in 2010 found that 15% of fathers had not known about their entitlement to Paternity Leave and another 8% had been illegally told by their employer that they were not to take it. Although in Britain only one in five families has a father who is the sole earner, women’s employment remains undervalued and a pay gap exists between male and female earnings, meaning it often makes financial sense for men to return to work if they are the higher earner. According to a 2009 report by the Equality and Human Rights Commission some 45% of new fathers said they did not take paternity leave. Of those, 88% said they would have liked to have done so, and 49% said they could not afford it. As it stands, fathers are entitled to just £138.18 a week – the equivalent to £3.45 an hour, well below the minimum wage. Such financial considerations are preventing new dads, especially low paid fathers, from taking time off because they simply cannot afford to take leave on such a reduced income. This does not mean fathers are not interested in taking leave. In 2005, when the idea of Additional Paternity Leave was suggested, the government estimated that only between 4-8% of new fathers would take it up, yet a survey by the Fatherhood Institute found 81% of men supported the new opportunity. Only 16% said they would not take any of the leave, with 21% keen to take the whole six months, and another 47% interested in taking between one and five months. Where men would take Additional Paternity Leave, 55% stated this was because they want to look after their baby themselves, with 43% seeing this as benefiting their child. Two out of three of all participants believed they would be as competent as their partners in looking after the baby. Ultimately government policy is moving in the right direction to encourage and facilitate more equal caring and earning and is providing opportunities for men not available even a decade ago. However, given that one Conservative minister described the recent Shared Parental Leave scheme as a ‘crazy’ proposal, whilst other critics claim parental leave schemes are wasted on men who are ‘useless’ when a baby is born, there is much that hasn’t changed since 1979. While old concepts of man as breadwinner and woman as home-maker are not what most couples aspire to, for many families the material situation reinforces traditional male and female roles and perpetuates the underlying expectation that women are the ones who take responsibility for childcare. Even labelling new proposals for paternity leave as ‘daddy month’ implies that with regards to childcare, the father is a temporary ‘helper’ for the month, not expected to be fully competent or equally responsible when, ultimately, he returns to work and the mother is left holding the baby. These cultural expectations are not only outdated but actively hamper men, women and children. Fathers and children miss out on time spent together and mothers are forced to assume the role of primary carer, which reinforces gender inequality in both the home and workplace. Overall, evidence suggests that while fathers are able and willing to contribute more substantially to family and home life, society does not fully expect or enable them to be equally responsible parents. Both structural frameworks and cultural attitudes together must change this. I recently co-organised and presented at the Scottish Oral History Centre’s Inaugural Postgraduate conference, ‘Face to Face with the Past: Postgraduate experiences of Oral History.’ Writing the paper, I was forced to think about why I have chosen oral history to examine the nature of fatherhood in late twentieth century Scotland. While a number of, often contradictory, representations of fatherhood can be found from a range of sources, few historical studies have used oral history to explore the experiences of fatherhood. Fewer still have conducted original oral history interviews; we know very little about how fatherhood was experienced in the past from men themselves. This is partly because while the place of the father in family life has gained some attention from historians, this has only been true of certain groups of men, in certain historical periods. Whilst middle-class fathers have been given a place within the home from the eighteenth century onwards, working-class fathers appear only on the margins of family life, and histories of fatherhood in the twentieth century are largely neglected. Yet it is during this period that it was believed the nature of fatherhood was changing. Male and female roles were challenged by the changing labour market, deindustrialisation and unemployment, feminism and an increase in the number of women entering paid employment. The rise in divorce, cohabitation and remarriage led to multiple family forms. The fathers’ rights movement was established, there was a dramatic growth in the number of fathers attending childbirth from around fifty percent in the late 1970s to over ninety percent in the 1990s, and the ‘new man’ who was caring, sensitive and willing to take an equal responsibility for childcare was to be found in everyday culture via television, film, newspapers, celebrities and politicians. Although women remained responsible for the majority of childcare and housework, time-use studies suggest that between 1975 and 1997, British fathers’ care of infants and young children rose by some 800%, from fifteen minutes to two hours in the average working day. The time British men spent on domestic work rose from an average of ninety minutes a day in the 1960s to 148 minutes per day in 2004. While such statistical evidence is undoubtedly useful, figures claiming fathers’ share of housework and a number of physical childcare tasks can only tell us so much. They do not provide insight into how men felt about their parental roles, their role in decision making, and levels of interest, knowledge and sensitivity to their child’s behaviour, and how these changed over time. 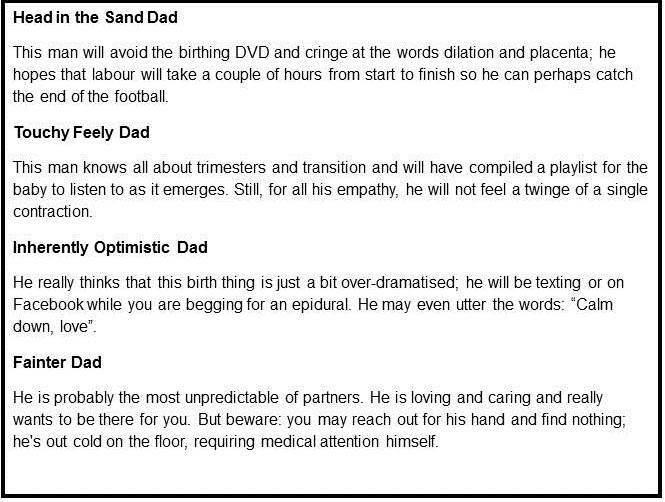 As a result, what fathers ‘did’ has often been taken to suggest what they ‘felt’ when this might not always have been the case. While many fathers may not have taken an equally responsible role for childcare, this does not indicate that they were not equally loving or invested in their children, or that they were ‘cruel’ at worst and ‘incapable’ at best. Particularly when fatherhood was strongly associated with the ability to provide financially and the stereotyping of men as useless parents was, and still is, widespread. In the early nineties, children living with a lone father were forty-eight times more likely to go into care than children from two-parent families, British fathers worked the longest hours in Europe and men only got the right to two weeks paternity leave in 2003. There has been much diversity, continuity and change in the representations and experiences of fatherhood throughout the twentieth century. There are clearly many kinds of fathers, trends toward both more caring and traditional fathering may co-exist and men may even transition between these two within their own lifetime. None of these complex and subtle elements can be conveyed by a single statistic claiming how many hours a father spent with his child. Becoming a father is life altering and fatherhood is a crucial part of many men’s identities and experiences. Oral history is therefore a particularly effective way to explore men’s positions within the home and family and to examine how fathers in the past viewed, experienced and enacted their parental role, then and now. There are nevertheless a range of methodological issues which can arise from using oral sources to explore fatherhood. The present notion that fathers today are now more involved with their children and family life and that this is a positive phenomenon will certainly influence the memories recalled, the identities embraced and the narratives constructed. Oral history is able to offer evidence of the attitudes, beliefs and values attached to fatherhood but cannot necessarily be used to determine behaviours and the conduct of fatherhood: what men actually did in the past. However, I will take the approach that the dialogue with the present will be productive and oral evidence does not have to be literally ‘true’ in order to be of historical value, as the personal meanings embedded in people’s memories of the past are all valid. I believe that using oral history to voice the experiences of fathers themselves will be central to breaking down the stereotypes about working-class fathers in Scottish society and demonstrating that so many were in the past and continue to be loving, warm and caring fathers.